Example of retinal ganglion cells with dendrites in the retina of a healthy eye. Glaucoma, the second leading cause of blindness, usually stems from elevated eye pressure, which in turn damages and destroys specialized neurons in the eye known as retinal ganglion cells. To better understand these cellular changes and how they influence the progression and severity of glaucoma, researchers at University of California, San Diego School of Medicine and Shiley Eye Institute turned to a mouse model of the disease. Their study, published Feb. 10 in The Journal of Neuroscience, reveals how some types of retinal ganglion cells alter their structures within seven days of elevated eye pressure, while others do not. “Understanding the timing and pattern of cellular changes leading to retinal ganglion cell death in glaucoma should facilitate the development of tools to detect and slow or stop those cellular changes, and ultimately preserve vision,” said Andrew D. Huberman, PhD, assistant professor of neurosciences, neurobiology and ophthalmology. Huberman co-authored the study with Rana N. El-Danaf, PhD, a postdoctoral researcher in his lab. Retinal ganglion cells are specialized neurons that send visual information from the eye’s retina to the brain. Increased pressure within the eye can contribute to retinal ganglion cell damage, leading to glaucoma. Even with pressure-lowering drugs, these cells eventually die, leading to vision loss. In this study, Huberman and El-Danaf used a mouse model engineered to express a green fluorescent protein in specific retinal ganglion cells subtypes. This tool allowed them to examine four subtypes of retinal ganglion cells. The different cell types differ by the location in the eye to which they send the majority of their dendrites (cellular branches). 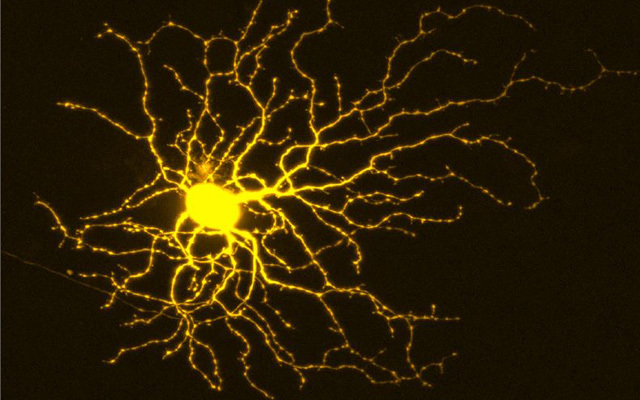 Within seven days of elevated eye pressure, all retinal ganglion cells that send most or all of their dendrites to a region of the eye known as the OFF sublamina underwent significant rearrangements, such as reductions in number and length of dendritic branches. Retinal ganglion cells with connections in the ON part of the retina did not. This research was funded, in part, by the Glaucoma Research Foundation Catalyst for a Cure and the E. Matilda Ziegler Foundation for the Blind.